Grunion "runs" happen on many beaches along the Southern California coast, but nowhere as much as at Bolsa Chica State Beach. These silvery blue, sardine-sized fish live off the Pacific coast only between Point Conception and Baja California. They may look ordinary, but their reproduction methods are anything but. They only spawn on the sandiest beaches, from March through September, after the highest tides following each full moon. And that's just the start. The females fling themselves onto the beach via incoming waves and dig into the sand by their tails. Males wrap around the females. On a plentiful run, the little fish can converge on a beach in the thousands. 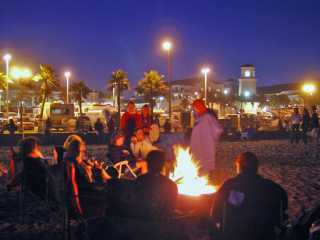 Better yet, on your Southern California beach vacation, do as Californians do and make it a party! The state allows you to catch them, but only with a fishing license - and be sure to only catch them by hand. You can find out more at the California Department of Fish and Game's Web site about these fish. There's plenty of more traditional ocean fishing in Southern California. Find out more about ocean fishing charters. Find great Huntington Beach hotels while you're on your run. And here's a link to our directory of Huntington Beach restaurants. Come back soon: we'll be adding an interview with a photographer who specializes in these fish (we're not kidding). Return from the grunion page to the Huntington Beach page.